For weeks, Elizabeth and I (Tim) have had April 14th, 2013 circled on our calendar. Why? 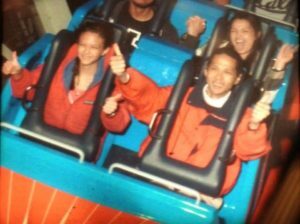 Because this was the day that our Disneyland annual passes expired. So Lizzie and I wanted to make the most of it. That day would be our special day together. Because California Adventure opened at 8:00 AM, we rose early and left for the park at 7:00 AM. By 7:45 AM, we had parked our car, taken the shuttle to the park, and were standing near the front of the rope that blocks people from the attractions (unless you have an early-entry pass). 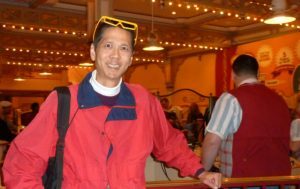 At 8:00 AM sharp, when they released the rope, Lizzie and I walked briskly to Toy Story Midway Mania (3-D shooting arcade game). Arriving at the attraction, we walked through the gate, were handed a pair of 3-D glasses, and were immediately on our way! It is SO fun! We love shooting targets, popping balloons, doing the ring toss, breaking plates, etc. We aren’t really destroying any real targets…it is all “virtual” like a huge video game. Justin and Jeffrey have watched videos on YouTube where they learned tips on how to release higher value targets and score more points. They’ve shared their insights with the rest of the family. So now we all love to see how many points we can score. 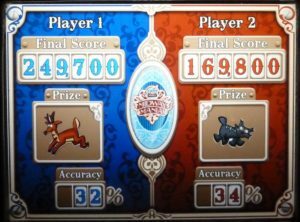 Midway Mania Scores. Click photo for full size. 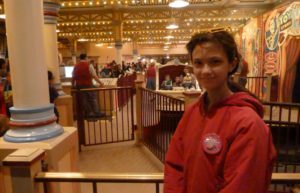 Disney has an innovative system which allows users to hold one FASTPASS at a time to bypass regular lines at some of their more popular attractions. With a little planning, you can minimize your time in lines and maximize your enjoyment. Because our goal was to get FASTPASSes for Radiator Springs Racers at night, we headed to Cars Land after Midway Mania. However the return time (which is the time that you can use your FASTPASS) was 3:30 PM to 4:30 PM…too early. So we did Luigi’s Flying Tires which took about 30 minutes. So now it’s 9:30 AM which means that it’s almost time to head home. Now the Racer’s return time is 7:40 PM to 8:40 PM…perfect! So we get our FASTPASSes and head home. We make it home in time to get ready for church. Because Josiah was still not feeling well, I stayed home with him. After church, we ate lunch together as a family. After eating, Lizzie and I pack up the food (sandwiches) that we prepared the night before and head to Disneyland. Because we had never done Splash Mountain (a water ride) before, we get FASTPASSes for it. 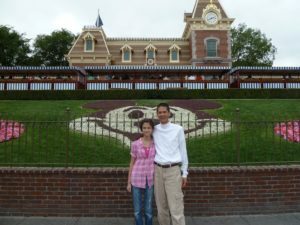 Elizabeth and Tim just inside Disneyland’s Entrance. Click photo for full size. We tried unsuccessfully to get a seat at the Royal Theatre (to watch a live mini-production of a fairy tale)…which is just as well since they would be performing “The Beauty and the Beast” which we had seen on Friday. Next to the Royal Theatre, we watched Mary Poppins along with some supporting cast and band members perform a few numbers. Mary Poppins at Disneyland. Click photo for full size. 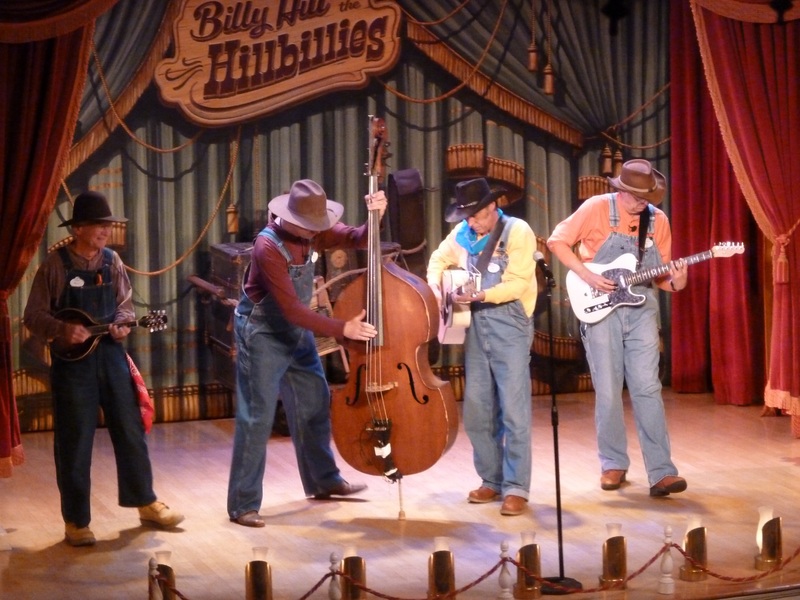 Next we headed to the Golden Horseshoe Corral to watch Billy Hill and the Hillbillies. Even though we’ve seen them before, they are always entertaining with Blue Gras music and comedy. No two shows have been exactly the same. Billy Hill and the Hillbillies. Click photo for full size. Afterwards, we headed to Splash Mountain which is a great ride for hot, sunny days but not so great on cool, cloudy days like it was. Although we kept our jackets on and zipped up, we still got our legs wet. Lizzie was in the very front of the canoe and I was right behind her. 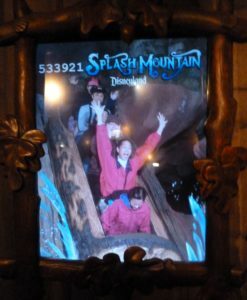 Tim and Elizabeth on Splash Mountain. Click photo for full size. Next we did the Winnie the Pooh and Tigger ride followed by Davy Crockett’s Explorer Canoes. We wanted to cross over to Tom Sawyer Island but the raft shuttle ended at 5 PM; so we just missed out. We sat down at New Orleans Square to each our almond butter and jelly sandwiches plus popcorn, carrots, and chocolate chips (for dessert). We stuck around the square to hear the next music group. I was expecting a singing group but it was a jazz ensemble. So after their first song, we got in line for the Disneyland Railroad. We took the train to Mickey’s Toontown. Then we walked to Mr. Toad’s Wild Ride in nearby Fantasyland. We knew that we wanted to be back in California Adventure before dusk (around 7:25 PM). So we started walking to the gates. 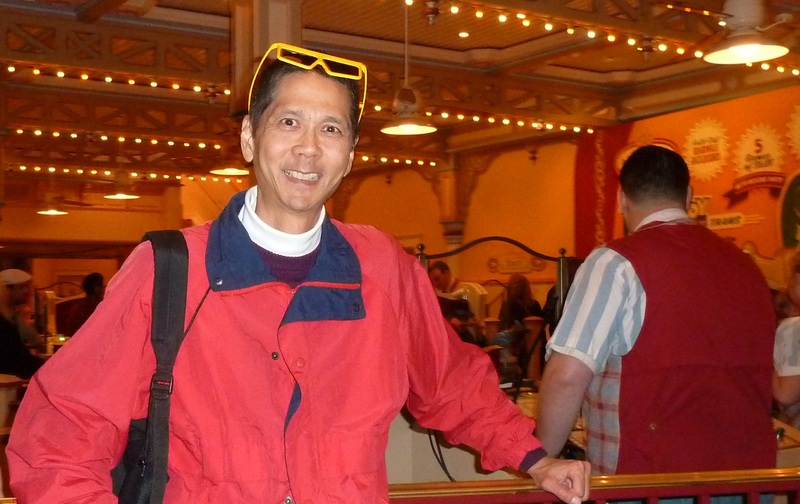 We swung by Star Tours to see if it had a short wait time. Because the wait was 40 minutes, we kept on going. Now the time is about 6:45 PM. Tim and Elizabeth back in California Adventure. Click photo for full size. While we were browsing in a shop in Cars Land, “the” song (Life is a Dream) came on. So we headed out to watch the lights come on. Because our return time for Radiator Springs Racers was between 7:40 PM and 8:40 PM and it wasn’t really dark yet, we wanted to wait a bit longer to do the ride. So we did The Bakery Tour, got our picture taken, and headed back to Cars Land. Tim and Elizabeth in front of Flo’s Cafe. Click photo for full size. 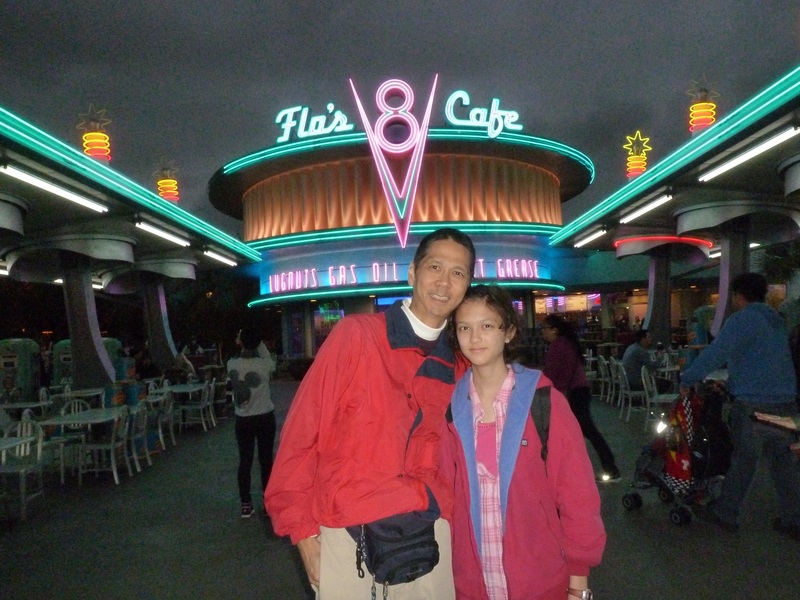 But now Radiator Springs Racers was down due to technical problems, so we headed to Paradise Pier. We did California Screamin’ and sat in the very front of the roller coaster. Our wait time was only 15 minutes. 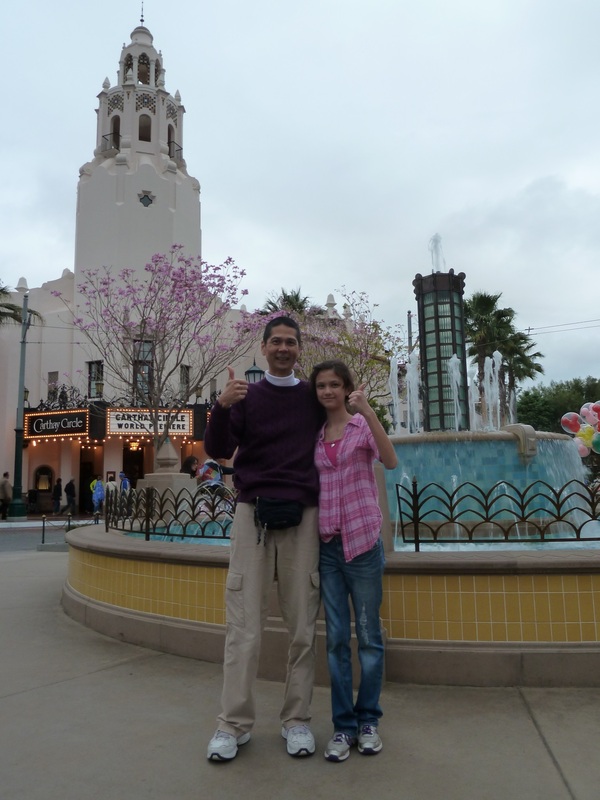 Then we did Goofy’s Sky School. As we walked back to Cars Land, we noticed that there wasn’t any wait for Ariel’s Undersea Adventure (from The Little Mermaid). So we hopped on. Elizabeth and Tim in the Very First Row. Click photo for full size. By now it’s getting close to our FASTPASSes expiration time. So we boogied back to Radiator Springs Racers. The ride was back up and running! The single-rider line was extremely long; the regular line had a one-hour wait. Thanks to our FASTPASSes, we had to wait only 15 minutes to get on the ride! 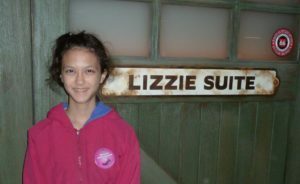 Exiting the ride, there is a place called Lizzie Suite. Lizzie Suite. Click photo for full size. After that, we stopped again at the bakery and got our only treat, a chocolate muffin. 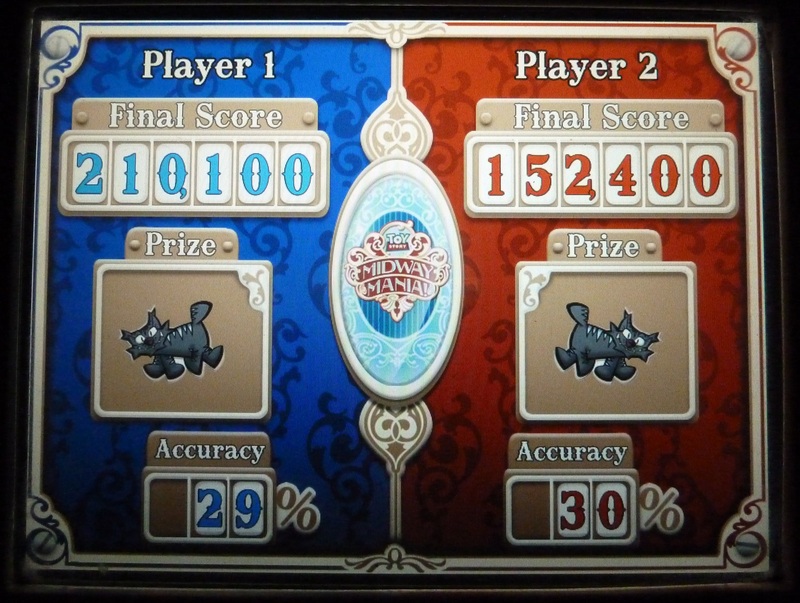 We ate the muffin during our 15-minute wait for Toy Story Midway Mania where I tried to help Lizzie get the high score. She was doing quite well through the first three games but we couldn’t get the alien ship to launch. She ended up with 154,000 which fell about 10,000 short of her personal best. So we got in line again. Now the wait was down to 10 minutes. This time Lizzie was going to help me get high score. We each did really well. Each of us got our all-time personal high score. 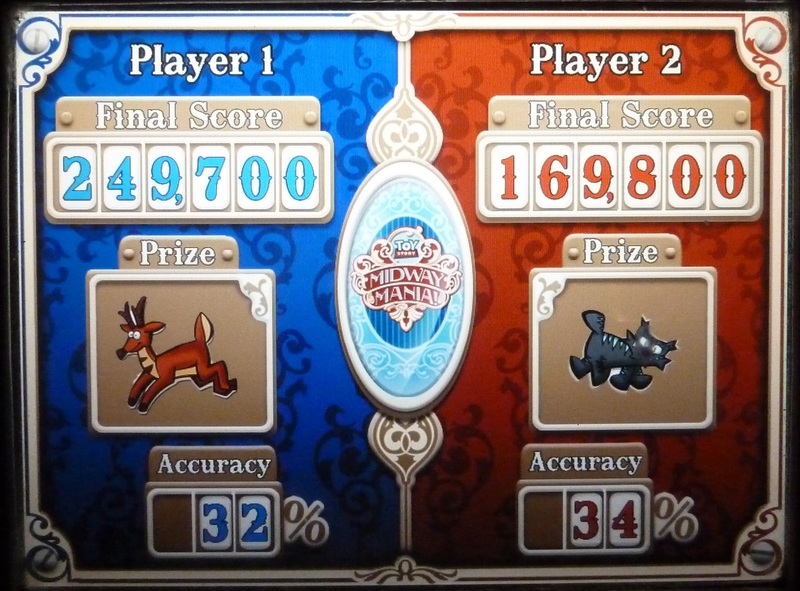 I got 247,000 and Lizzie got 169,000. Lizzie ready for Midway Mania. Click photo for full size. Tim ready for Midway Mania. Click photo for full size. 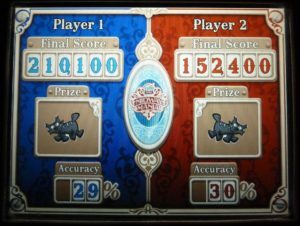 Midway Mania Scores – Tim and Elizabeth. Click photo for full size. 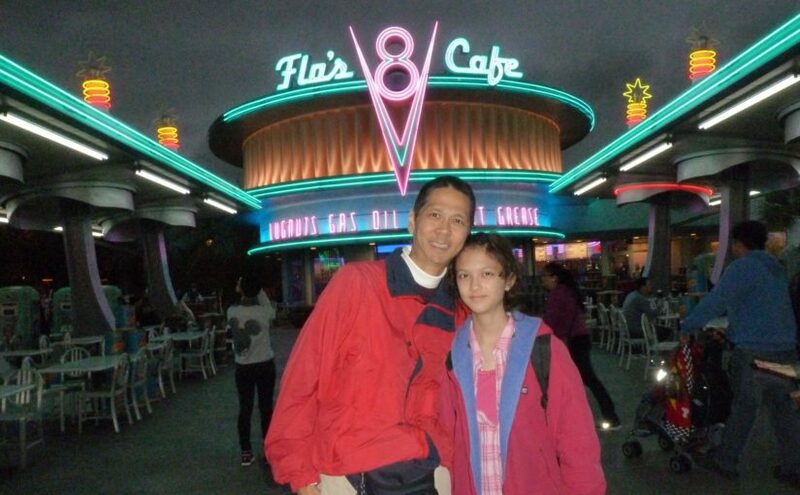 Now the time is a few minutes before 10 PM which is closing time for California Adventure. We considered doing Midway Mania one last time. But Lizzie wanted to get more (free) sourdough bread samples. So we dashed back to the bakery. She ended up getting five slices (instead of the normal one or two); I got three. Net we found a spot to watch the World of Color (laser water show) which started at 10:15 PM. The show is absolutely spectacular with music, water, lights, and fire. Because it was the second and last show, we were able to find a nice viewing spot. After the show ended, we checked the time; it was 10:45 PM. Because Disneyland closed an hour after California Adventure, we had 15 minutes to get back to Disneyland and on to the Star Tours ride. So once again, we walked briskly…running isn’t allowed. For those that don’t know Star Tours is a ride based on Star Wars. You wear 3-D glasses and feel like you are moving through space. The “movies” are randomly selected. We made it to Star Tours with a few minutes to spare. As we waited the five or so minutes to board our “space ship”, we were both hoping for either a new or a fun “tour.” We were not disappointed. It was both new and fun! Exiting Star Tours, it is now 11:10 PM so we join the crowds making its way to the exits. The Toy Story parking lot was nearly empty. Traffic was light. We made it home just before midnight. Jeffrey and Jason were still up playing Monster Hunter on the WiiU. So I was in bed by 12:20 AM. The day had started about 19 hours earlier. Lizzie and I had spent over 10 hours at Disneyland. What a great day filled with memories that Elizabeth and I will never forget. What makes Disneyland so enjoyable to me is that when I’m there I forget about all of my stresses and problems. My focus is simply to have fun and enjoy time with my family. My only regret was that I hadn’t spent more one-on-one times with the other children as well.